Investors look at computer screens showing stock information at a brokerage house in Shanghai, China, April 21, 2016. But analysts and the New York-based index provider MSCI have noted that continued resistance by China to further open its markets and questions about whether it will press ahead with much needed reforms remains a key concern. In a statement late Tuesday, which included a decision to return Pakistan to its Emerging Market index, MSCI said lingering concerns about limits on capital flows out of the country, trading suspension rules and broad restrictions that require pre-approval before any financial institution or stock exchange can release products linked to Chinese "A Shares" were some of the key reasons for the decision. The statement called the pre-approval requirements “unique in Emerging Markets” and also noted that such regulations run the risk of disrupting trading if a Chinese exchange were to withhold approval. "A Shares" are stocks of Chinese companies that are off limits to overseas investors and can only be purchased through a specially regulated program known as Qualified Foreign Institutional Investor (QFII). MSCI listing is expected to not just enlarge the scope of QFII program, but also lead to relaxation in controls on foreign investments. Earlier, MSCI had estimated that inclusion in its Emerging Markets Index could draw $400 billion into Chinese shares in the next decade. But some analysts believe this kind of inflow is possible in five years because of the large number of Chinese companies are planning to list in exchanges in New York, London and Hong Kong in the coming years. Either way, when the decision is finally approved the shift to "A Shares" by MSCI is likely to be gradual. Chang Liu, a China Economist with Capital Economics said that at the beginning it is likely to be limited to five percent of "A Shares". "If [after inclusion] the weighting of China’s stocks is increased over time [which is the plan according to the roadmap published by MSCI last year] it could have a significant impact on both China’s equity markets and even on the renminbi exchange rate," Liu said. 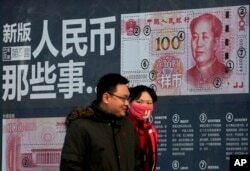 FILE - A couple walk past a display showing the security features of the new 100 Yuan note in Beijing, Monday, Jan. 11, 2016. The China Securities Regulatory Commission said the decision to not include Chinese "A Shares" would not have an impact on the country’s reform and opening process, adding that China needs to build long-term, stable and healthy capital markets. But it also questioned how any index could overlook China’s "A Shares" index, whose international influence is growing, adding that without "A Shares" the index would be incomplete. The statement said nothing about the specific concerns raised by MSCI. 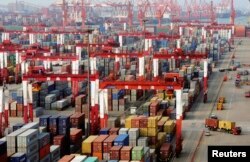 FILE - Trucks drive past piles of shipping containers at the Qingdao port in Qingdao, Shandong province, June 8, 2014. Instead of focusing on the size of its economy and benefits Beijing’s membership could bring, China should be using the decision as an opportunity for self-reflection, said Fraser Howie, co-author of the book Red Capitalism: The Fragile Financial Foundation of China's Extraordinary Rise. “They should be asking why is it these other emerging markets that are not as economically developed as us, are getting access?” Howie said. “You can open up your markets in many ways without losing control. No one is expecting the Chinese to be perfect or of the full openness of let’s say markets in Europe or in the states, there is much the Chinese can still do,” Howie said. What that doesn’t include, he added is last minute decisions and rule changes, such as the one markets made shortly before the MSCI announcement. In late May, China’s two main indexes announced that trading suspensions for companies involved in major asset restructuring could last for three months and for more than one month for private placement. In its statement, the MSCI noted that the decision was a positive step, but added that a period of observation was needed to see just how the rules were used in practice. 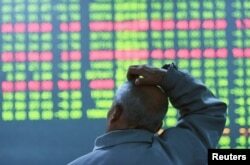 Last year, when China’s stock markets plunged about 40 percent, around half of Chinese listed shares voluntarily suspended their trading. Some extended that halt in trading for months to avoid the volatility of the market. FILE - An investor looks at an electronic screen showing stock information at brokerage house in Hangzhou, Zhejiang Province, China, Jan. 11, 2016. Analysts note the underlying problem is one of control versus market forces. In its statement, MSCI listed two problematic areas in its rejection of China. It opposed a 20 percent limit China has imposed on foreign investors for repatriating their investments and profits during share sell-offs. The index maker also expressed concern over the Chinese system that allows local exchanges in Shanghai and Shenzhen to impose pre-approval restrictions on launching financial products. China is unlikely to meet those requirements, said Oliver Rui, a professor at the China Europe International Business School. "Removing the 20 percent monthly repatriation limit and the local exchanges’ pre-approval restrictions could increase the volatility of RMB and the stock market," he said adding that for China "the stability of the RMB and stock market is more important" than MSCI listing.